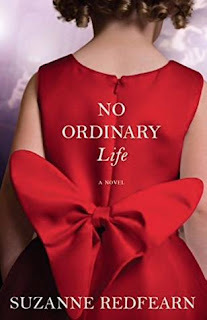 No Ordinary Life completely engrossed me from the start. I was immediately drawn to adorable Molly. (Cute as a button, you could picture her sprinkling her sweetness all over the place.) I was also happy Suzanne Redfern initially introduced us to the characters in the town they came from because the novel rapidly moved to LA and a completely different existence. In this case their original surroundings gave a good grounding for the people that they had been before their lives changed- without it I don’t think I would have found them so realistic nor empathised with them so much. I’ve often wonder what kind of person it takes to live the life of a star like this? It seems like so much work, so much planning and then so much boredom. It’s also a false sense of reality for a child to grow up in this way- the adoration juxtaposed with the isolation. One of the older actresses on the set quite clearly tries to warn Faye of the difficulties while still trying to show her it’s possible to have a good life. The children were written really well, you could tell Redfern had given them as much thought as the adults in the novel. They behaved exactly as one would expect and even the budding relationships between the teens were perfectly enacted. The one character I didn’t really understand was Sean. As the father of the children I never grasped if he was on their side of if he was simply out to get money? His role in the novel seemed to be unfocussed and he behaved completely out of character than the man we were initially introduced to (who simply couldn’t cope with being a father) . There are a good many people to follow throughout No Ordinary Life but they melded together and were all there for a reason. The story is perfectly executed and I was fully drawn in from the very start.